It feels as if Hazrat Sultan Bahu Rahmatu-Allahe Ta-aala Alaihe wrote these Punjabi couplets in the initial stages of his Demand when he, according to Manaqib e Sultani, visited the place of Hazrat Shah Habeeb Sahib who was of the progeny of Hazrat Mahboob e Subhani, Qutab e Rabbani, Ghaus e Samadani Hazrat Shaikh Muhyiddeen Sayyed Abdul-Qadir-Jelaani (Qaddas-Allahu Sirru-hul Aziz ) . He had inhibited a village near Shor Kot and named this village 'Baghdad' that is still famous in the name of 'Garh Baghdad'. Tall and long trees of Cheel (Cypress) were there in Garh Baghdad in those times. Cheel is a common tree of Punjab. Here Baghdad does not mean the Baghdad city of Iraq where there is the holy shrine of Hazrat Mahboob e Subhani, Qutab e Rabbani, Ghaus e Samadani Hazrat Shaikh Muhyiddeen Sayyed Abdul-Qadir-Jelaani (Qaddas-Allahu Sirru-hul Aziz ) and there do not grow any other tree other than date palms. Further, there is no mentioning of his any tour to the sacred Baghdad in books. Nevertheless, people have mistakenly believed that the Baghdad here means the Baghdad of Iraq and Arab. Since his heart was full with the zeal and Muhabbat of Lord since his early age and he had visited Garh Baghdad in the court of Hazrat Sayyed Habeeb Shah with an innocent heart, hence, everything there was seen by him lovable and endearing the tall and high tree of Cheel (cypress) were liked by him much. Therefore, praise for those trees came on his blessed lips and under the Talqeen of Hazrat Sayyed Habeeb Shah for the Mashq-e-Wujoodia, his gaze and Tawajuh focused upon the composition and structure of his body as he has expressed in these couplets that the body of the human being is like a shirt of elements which has been prepared by the tailor of the Qaza and Qadr (Power) by sewing pieces and parts of different types of clothes. Thus he, in these couplets, mentions his action of going out for Allah in His Demand and to find Him wearing shroud and coarse garment of his earthly raiment, and of joining the Faqeers and Dervishes, and of sustaining on the pieces of bread earned by begging, and for making the Wird of the blessed name 'Meeran Meeran' of Hazrat Mahboob e Subhani, Qutab e Rabbani, Ghaus e Samadani Hazrat Shaikh Muhyiddeen Sayyed Abdul-Qadir-Jelaani (Qaddas-Allahu Sirru-hul Aziz ) his possession and provision of journey and he considers these actions as the Waseela and way of reaching unto the Real beloved , that is, Allah Almighty. In a book, he tells that he has travelled for thirty years in search of the Murshid-e-Kaamil of which one was Hazrat Sayyed Habeeb Shah. Hence, in this long time, he met different Saints of that time. 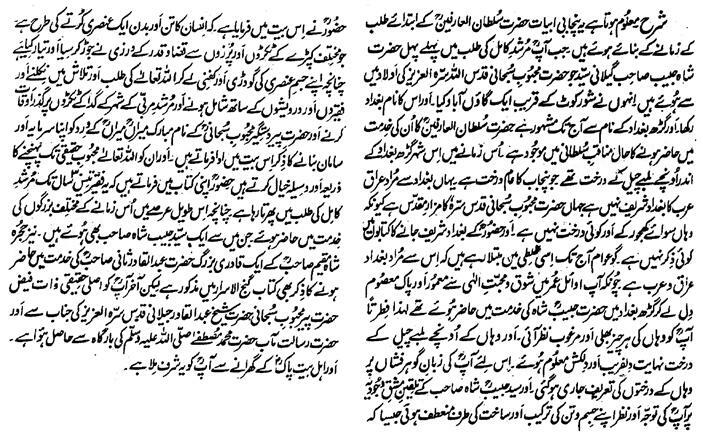 He has also mentioned in Ganj ul Asraar about his meeting with Qadiri Saint 'Hazrat Abdul Qadir Saani' of Hujra Shah Muqeem. However, he received the original Beneficence of the Essence from Hazrat Mahboob e Subhani, Qutab e Rabbani, Ghaus e Samadani Hazrat Shaikh Muhyiddeen Sayyed Abdul-Qadir-Jelaani (Qaddas-Allahu Sirru-hul Aziz ) and from the blessed Court of his highness the Overlord of Worlds the Holy Prophet of Allah Hazrat Muhammad Sal Allahu Alaihe Wa Aa-lehee Wa-sallam and this honor has been endowed upon him by the blessed Ahl e Bait Radhi-ya-Allahu Ta-aala Anhum .